The Society of Explorers and Adventurers, or the S.E.A. for short, has been regularly adding members to its ranks throughout the years. Some of these members have a long history, but whose involvement with the S.E.A. is a recent revelation, while others wash ashore with new attractions or experiences. One of these members, Mary Oceaneer, may be new to Walt Disney World, but she has a storied past. She is included in several photographs in the queue for Hong Kong Disneyland’s Mystic Manor, as well as in the Oceaneer Labs aboard the Disney Cruise Line ships. The Oceaneer Labs are where Mary’s history as a treasure hunter, adventurer, and protector of the seas is really fleshed out. When Typhoon Lagoon opened Miss Adventure Falls earlier this year, it brought with it a stranded Captain Mary Oceanear and her parrot companion, Duncan. 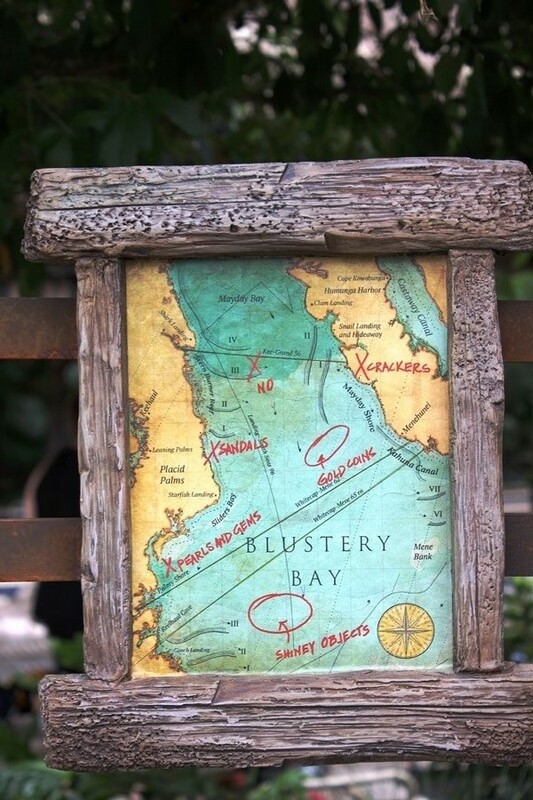 While the pair may be shipwrecked, we are left with many artifacts that assist us in putting together her story, as well as the story of Typhoon Lagoon. Featured alongside her diving bell, periodicals, and crates is a nautical map of the area. If you examine the map closely, you’ll realize that the attraction names in the park were not assigned at random as they are, in fact, taken from previous feature names. For instance, there is a section of calm water named Castaway Canal, which seems perfect for a lazy river type of attraction. Meanwhile, Cape Kowabunga and Humunga Harbor get combined to create a thrill ride Humunga Kowabunga. 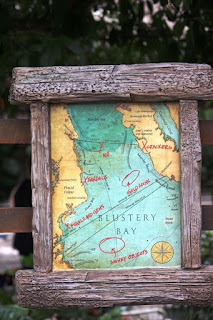 The list goes on and on: Stern Burner Reef, Placid Palms, Conch Landing, Keelhaul Cove, Blustery Bay, and others. It is also worth exploring the notations that Mary herself has left on the map. As a procurer of rare artifacts from deep in briny sea, we should be surprised that areas have been denoted of where she has either found, or believes she can find, gold coins, pearls and gems, and shiney objects. The misspelling and lack of detail around the shiny objects may seem a bit out of character for Mary, but you try to keep everything straight after being shipwrecked! Also called out on the map are sandals and crackers. These would definitely be necessity items if you had just washed ashore in a tropical paradise with a parrot. Last, but certainly not least, is a single X with the word ‘NO’ written beneath it. This happens to be jotted down in the area of Mayday Bay. Now, while the wave pool of the water park may be known as Typhoon Lagoon to guests, situated against the backdrop of Mount Mayday, it is safe to assume that this may not have always been its name. If Mount Mayday has been present in the area pre-storm, it would stand to reason that the tidal area at its base could in theory be called Mayday Bay. If this were true, a treasure hunter in diving bell would certainly want to steer clear of the turbulent waters. No matter how you came to know Captain Mary Oceaneer, her story is one that has spread across the globe and its seven seas. The S.E.A.’s ranks are filled with wonderful stories and relationships that connect parks to one another, and Mary is a fine example of this connectivity. While I await my S.E.A. membership, I will continue to study the artifacts Mary and her colleagues have left behind.